No one can deny that an Italian meal is a truly sensory experience. When you sit down to an Italian meal, the traditional first course is “antipasto” (plural: antipasti). The term is derived from Latin “ante” (before) and “pastus” (meal, pasture). Artfully conceived, antipasto presentations are generally colorful and boast many diverse items, to get people excited for the meal. Whether you are hungry or not, the antipasto is meant to get your appetite going and prepare your taste buds for more. The antipasto course is not meant to be too filling, while still engaging all of your senses. 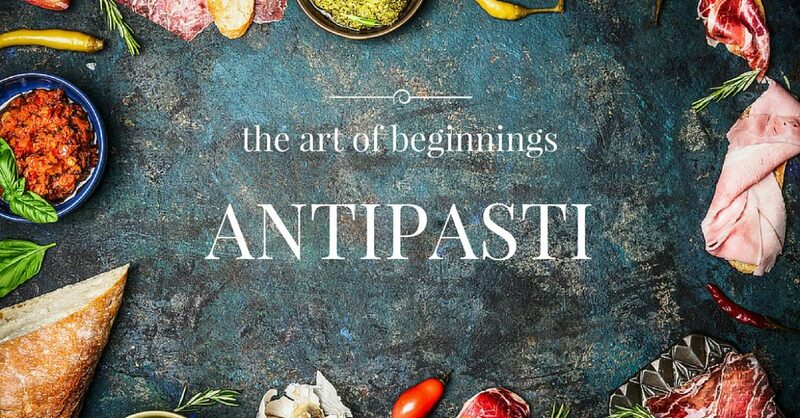 The history of antipasto is rooted in medieval Italy. Sweet and savory finger-foods such as sugared nuts and sliced ham got diners in the mood for a meal. With the evolution of Italian cuisine, antipasto has taken on the form of many new dishes. But the aim of antipasto is the same: to get you ready for the many courses to follow in a traditional Italian meal. The combination of flavors in an antipasto engages all aspects of our taste, from sweet to salty to sour to bitter to umami. In addition, there are many textures present in an antipasto presentation. Sweet elements of antipasto may include sugared nuts with a crunch, or the sweetness of a pickled sweet onion or pepper, or a light seasonal fruit. Dry cured meats, briny olives, and cheeses provide the salty and umami elements. Broccoli rabe or zucchini bring the bitter. Pickled or marinated vegetables such as artichoke, mushroom, or pepperoncini add mellow sour bite. Depending on the region in Italy, there are many different options for antipasto. With its proximity to the Alps stretching down to the Mediterranean and Adriatic Seas, Northern Italian cuisine showcases creamier foods from dairy rich regions and a bounty of fresh herb and oil from the more southern parts. Northern Italian antipasti reflect the diversity of Northern cuisine. You may see antipasti such as fresh mozzarella and basil pesto, polenta fritta, tuna and cannellini bean salad, fresh fennel, balsamic onions, fresh figs, olive tapenade, prosciutto di parma, and mortadella. The central region of Italy is known for its rich sauces, olive oil, and famous cheeses. Tuscany, the namesake for Cucina Toscana, is located in the central region and boasts a colorful cuisine of land and sea. Here at Cucina Toscana, our Tuscany-inspired antipasti include dishes such as burrata and roasted tomato, caprese salad with prosciutto (tomato, basil, fresh mozzarella), smoked salmon and fennel, sautéed seafood, eggplant, and a platter of assorted meats and cheese which include prosciutto, salami, gorgonzola, and fontina. The south of Italy features bold flavors of tomatoes and herbs, with creamy cheeses and seafood. Southern Italian antipasti dishes capture the fresh combination of Italian and Mediterranean cuisine. You’ll find dishes such as romano cheese, garlic and pepper antipasto, black olive tapenade, escarole, flat fillet anchovies, sweet and hot soppressata, castelvetrano olives, ricotta salad, artichokes, and roasted pepper bruschetta. Has all this talk of antipasto whetted your appetite? Visit us at Cucina Toscana to get your meal started!